I have created a complex Photoshop timeline animation (as opposed to a simple frame animation) that I would like to slow down. By "slow down" I mean increase the time between each frame and correspondingly increase the total duration of the animation. If this was a frame animation it would be easy, but I can't figure out how to do it for a timeline animation. I see that I can adjust the frame rate of the animation, but doing so keeps the total duration the same, whereas I want to adjust the frame rate and the total duration simultaneously. I'm looking for a solution that does not involve adjusting the frame rate and then manually adjusting all my keyframes (because I have too many to make that an easy process). 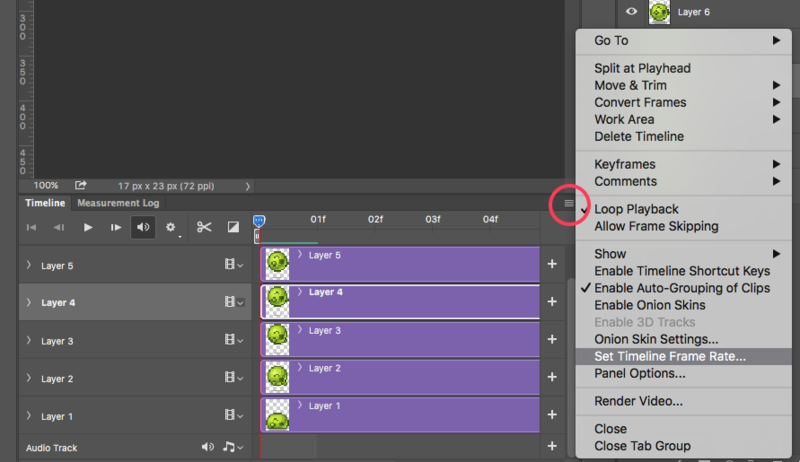 In Photoshop's timeline window, right click the layer. The options for duration and speed should open! 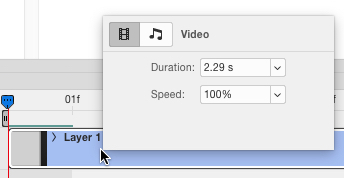 If the video layer is already in a "Video Group" and a Smart Object Layer... you have to open the Smart Object, and then right click THAT internal timeline to adjust the speed/duration. Just a straight video object without the "Video Group". You can only adjust speed and duration when a video layer is highlighted, because you're then changing the video clip, rather than its possible encompassing smart object. This works, but it does somewhat depend upon the layer structure of your file regarding where you have to click. I just checked and fastest method I could find without writing a Script or Action is to use AnimDessin2 (which is great and should be used anyways) then do it keyframe by keyframe. opt+[ / ] combined with the AnimDessin + button. Might be able to turn this into an Action to make it only one button but I'm not sure, I've never tried using Plugins with Actions or Shortcuts. 4.Setup with preferable Frame rate and ok.
You can select all frames in a "frame animation" by clicking on the first, holding shift and then scrolling to the last, and clicking that one. When all frames are selected, you can change the "Delay" amount by clicking the downward arrow on the bottom of each frame. The delay defines the wait time between one frame and the next. When all frames are selected, changing the "Delay" time will adjust all frames delay time. This link should provide the answer you seek.